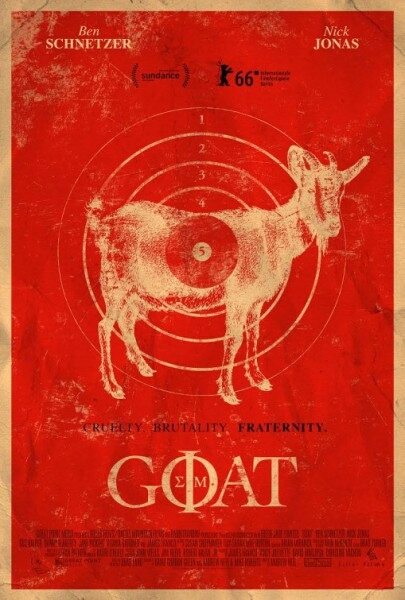 Andrew Neel's Goat fraternity hazing film hit film festivals earlier in the year to quite a bit of praise and from the looks of it revealed that Nick Jonas could actually act. This is also the first sorta mainstream film to tackle the horrific nature of hazing gone wrong with out of control bullying. I personally can't wait to see this film and it's definitely one of my most anticipated films of the Fall. Check it out below and sound off in the comments section with your thoughts. "Reeling from a terrifying assault over the summer, 19-year-old Brad Land (Ben Schnetzer) starts college determined to get his life back to normal. His brother, Brett (Nick Jonas), is already established on campus and with a fraternity that allures Brad with its promise of protection, popularity, and life-long friendships. Brad is desperate to belong but as he sets out to join the fraternity his brother exhibits reservations, a sentiment that threatens to divide them. As the pledging ritual moves into hell week, a rite that promises to usher these unproven boys into manhood, the stakes violently increase with a series of torturous and humiliating events. What occurs in the name of ‘brotherhood’ tests both boys and their relationship in brutal ways." Directed by Andrew Neel (King Kelly, Darkon ), co-written by Neel, David Gordon Green and Mike Roberts, based on the acclaimed memoir by Brad Land, GOAT provides a searing portrayal of masculinity, violence and brotherhood. The film is produced by Killer Films’ Christine Vachon and David Hinojosa with Rabbit Bandini’s James Franco and Vince Jolivette. Goat is set to hit theaters on 23rd.